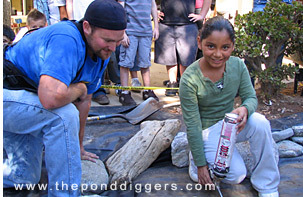 The Pond Digger initiated its Ponds for Schools curriculum-based program to benefit area schools. Ponds for Schools encourages schools to create an Outdoor Waterscapes Classroom in one day to use throughout the year for science, social studies, reading, art, and all subjects. 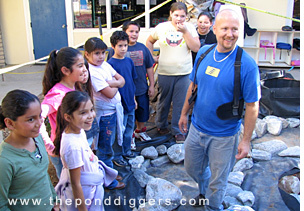 The Pond Digger has hosted Ponds for School events at several public and private schools from elementary levels all the way up to the college level. Students at Joshua Springs Calvary Chapel in Yucca Valley and West Valley High School in Hemet built ponds and pondless waterfalls in one day for their respective campuses. In Redlands, Montessori students learned from Exotic Aquatics how to do a waterscape using above ground containers. 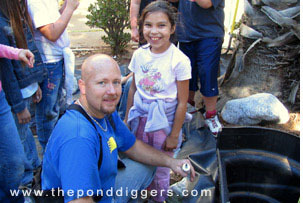 Our Ponds For Schools event at Franklin Elementary in Redlands, California was in the Fall of 2006. The sun was out, the weather was fantastic, the kids were super motivated to build a disappearing pondless waterfall and it was just an all around beautiful day to build a waterscape! A long time friend of The Pond Digger, Jeanie Hazelett was instrumental in getting the Ponds for Schools Program at her mother’s school at Cram Elementary in Highland, California, all the while being patient to have a Ponds For Schools event to call her own. At her earliest opportunity, Miss Hazlett spearheaded the Ponds For Schools project at Franklin Elementary School! The Pond Design was to be figured out ahead of time and the first part of the pond design was to not build a pond at all, in fact a “disappearing pondless waterfall” was in order for this Ponds for Schools location. What The Pond Diggers ended up designing at this school was a small disappearing pondless waterfall basin with a ten-foot stream and a two-foot tall waterfall. The disappearing pondless waterfall is located in a compact setting, so the sound of the water echoes throughout the courtyard benefiting not only the passer by with a wonderful audio sound but the surrounding classrooms as well. The entire school came by at one point or another to check up on the construction of the disappearing pondless waterfall but Miss Hazlett’s class was a major contributor to getting this waterscape completed in a timely fashion. Believe it or not with the help of her students, we built this disappearing pondless waterfall in only six hours! Thank you Franklin Elementary students, staff, and Miss Hazlett, for inviting The Pond Diggers to spend the day at your school, educating the community about waterscapes and pondless waterfalls! We would also like to extend a special thanks to Miss Haslett’s students for their efforts. Their help with the waterscape was much needed in order for The Pond Diggers to get this project done in a timely fashion. We had a blast working with you! We have listed the students names, along with their nicknames for the day! Victoria Robles (Tinker Bell), Cynthia Torres (Sponge Bob), Christian Proetel (American Flag), Quinn Maldonado (Navy Blue), Sienna Olmeda (Pink Flower jeans), Ines Maldonado (Levis), Diana Ramirez (Dark Pink), Alexis Ponce Avery (Light Pink), Mirella Delrosario (Camo-Girl), Leonely Barrientos (stripes), Bathseba Gonzales (Pink Nails), Gabriel Arreola Meza (Dodgers Rule), Jose Coronel (Dodgers Shorty), Melissa Maldonado (Enchanted), Johnny Macias (Pond Digger Shirt), Elisa Moi (Side Out), Dylan Thompson (Famous), Sophia Gaude (Punky), Daniel Aguero (Mr. Market! ), Franchesca Ramirez (Stripes), Danny Marquez (Hoops). We utilized the “disappearing pondless waterfall” approach to bring to life the natural streambeds of California Mission and Gold Rush lore at Mariposa School in Redlands. When activated with the flick of a switch, the waterfall begins flowing into the creek bed. The stream disappears into a pondless area containing a grate hidden under river rock, and then circulates underground up to the waterfall to flow again. When turned off, a small amount of water remains unseen in the disappearing pondless waterfalls that is filled with aquatic plants. The switch is located nearby in a locked box. According to fourth grade teacher Margee Fuller, who is the lead teacher for the school’s Master Gardener-designated demonstration gardens, the pondless waterfall installed by Exotic Aquatics, with student participation, literally brings our California history alive and is great contribution to our outdoor classroom! According to Eric Triplett, owner of The Pond Digger, “Students learn that in naturally balanced waterscapes or pondless waterfalls, you have an aquatic circle of life in which all parts complement each other and play an essential role in achieving natural born harmony. It’s a big picture lesson in the infinite and constantly revolving ecosystem.” The student-maintained waterscapes at Hemet West Valley High, Joshua Springs, and Mariposa schools were among the 50 featured on the Pond Tour For The Cure, hosted in 2003 by The Pond Digger, here in Southern California.